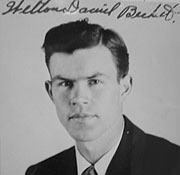 Often credited as one of the main architects who defined the mid-century architectural designs of Los Angeles, California; architect Welton David Becket began his career in Seattle. In fact, Becket was born in Seattle on August 8, 1902 and attended local schools, graduating from Queen Anne High School in 1922. He was most likely drawn to architecture through his family; both his dad and brother were builders. Beckett received his formal education from the University of Washington, where he graduated with a Bachelor of Architecture degree in 1927. After studying at the Ecole des Beaux-Arts in Fontainebleau for four months and traveling Europe with fellow classmate Paul Thiry for two months, Becket moved to California. By chance he ran into former UW classmate, Walter Wurdeman in 1930. Dissatisfied with their current jobs, the two decided to return to Seattle and form a partnership. That year Becket passed the State Architects exam (License No. L117) by reciprocity. Together, the two immediately began receiving commissions in and around Seattle. Business went well and by the summer of 1932 the firm moved into the Meany Hotel Building. Designs ranged in an eclectic array of styles, from the Art Deco Edmond Meany Hotel Garage (1931); to a Cape Code style house for Fred Harley (1930) in the Laurelhurst neighborhood; to a Tudor Revival style dwelling for H.O. Compton (1931) in Cedar Park neighborhood. Other known projects include the Cove Mid-City Market (1931) at the base of Magnolia; Eatonville High School and auditorium addition (1931); Delta Sigma Phi Fraternity (1931); a remodel of Sayles Candy Shop (1930) on University Way; a house in Meadowdale (1930); the American Wholesale Grocery Building (1933); and a Hotel (1930) at the SE corner of 8th Ave & Virginia in Seattle. For reasons unknown, reportedly Beckett and Wurdeman moved to Los Angeles in 1933, forming a partnership with established Los Angeles architect Charles Plummer. The trio gained considerable local publicity with their award winning design for the Pan Pacific Auditorium in 1935, which facilitated their entry into Hollywood film circles. The following years saw a series of residential commissions for movie starts such as James Cagney, Ceasar Romero and Robert Montgomery most executed in traditional Period Revival styles. Incorporated as Wurdeman & Beckett in 1939 after Plummer’s death, the firm prospered and expanded during the WWII era. Completing public housing and defense projects, the firm positioned themselves for the post WWII building boom, focusing on larger projects. Their best known designs include Bullock’s Department Store (1944) in Pasadena; and buildings for General Petroleum (1946); and Prudential Insurance (1947). After Wurdeman's untimely death in 1949, Becket renamed the firm Welton Becket & Associates. It grew to be one of the largest architectural firms in the United States with headquarters in Los Angeles and offices in San Francisco, New York, Houston, and Chicago. While working with Wurdeman, Becket developed the concept of "total design," whereby their firm would be responsible for master planning, engineering, interiors, furniture, fixtures, landscaping, signage, and even (in the case of restaurants) menus, silverware, matchbooks, and napkins. Becket also designed several buildings in the Seattle area during the 1960s. Projects include the I. Magnin Store with NBBJ in downtown Seattle (1954), Pay 'n Save Drug Store in Burien (1958) and the prototype for Tradewell Market chain in Burien (1959), The design in Burien, recieved a National AIA Award of Merit for its innovative design. Becket passed away in Los Angeles on January 16, 1969 but is buried in Seattle at Evergreen Washelli Memorial Park. Upon his death leadership of the firm was assumed by his son, MacDonald. In 1987 the firm was acquired by Ellerbe Associates and was renamed Ellerbe Beckett Inc.